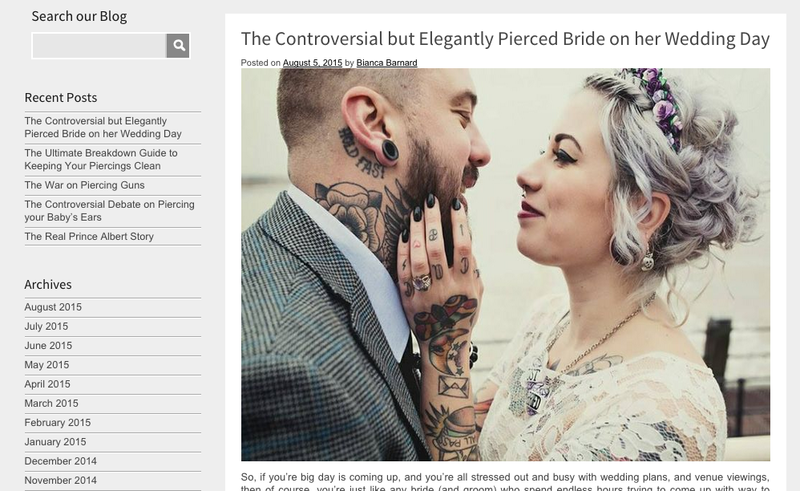 In June 2015 we were introduced to the director of Karma Se7en, a guru in the world of ecommerce, with a great portfolio of market-leading niche sites. With various different digital marketing projects on the table, we had to start off with one that would offer the best ROI for the company. 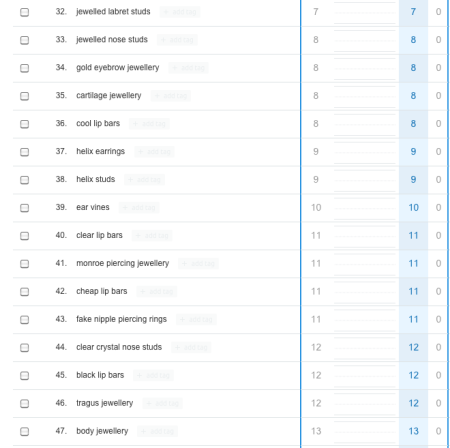 We decided on a technical onsite SEO audit to address various underlying issues that are holding the site back from competing with market-leaders. If the initial piece of work proved beneficial then there was opportunities for YouTube video SEO and offsite SEO campaigns. We were commissioned a 6 day campaign to complete this audit in July. The goal was to work out the most high-yield keywords related to their products and understand which pages we wanted to rank for any given keyword. To do this we studied the architecture of the website and figured out that the main categories in the primary navigation of the site were the best option and most likely to rank. 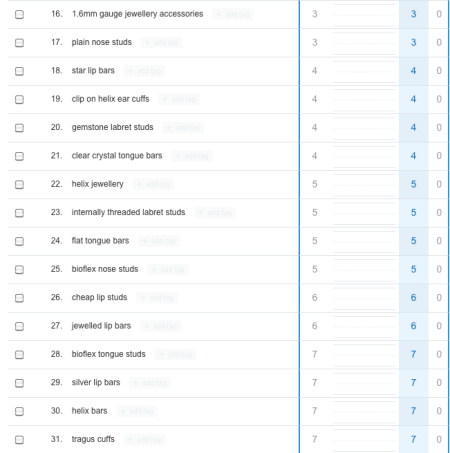 We then worked through the sub-categories found in these sections and created a master document (google doc) where we would map out the new metadata. As well as this, we had to consider what the weightiest page (the homepage) should rank for and decided on ‘Body Jewellery’ as this keyword gets around 7,000 searches a month in the UK alone. We could see that these important landing pages had poor metadata, particularly in the title tag. 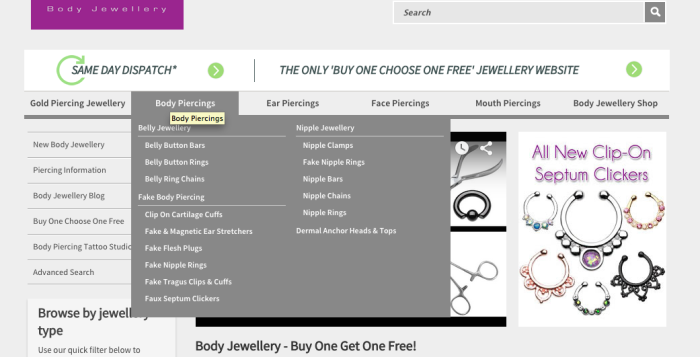 It became evident that title tags would commonly have keyword duplications, such as ‘Belly button bars | belly button bars’ – something Google would obviously not react well too. 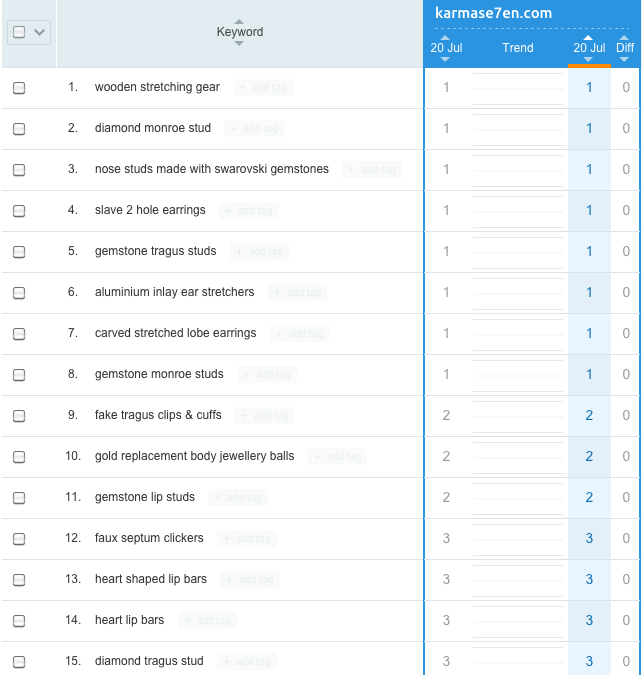 More often that not, each landing page had targeted a keyword with far fewer monthly searches, so even if the top-ranking was achieved it would not be having maximum impact on the market. To address this we mapped out the metadata for the pages we are targeting in the Google doc with a new title tag and new h1 tag. This makes updating the site very easy and simple to check the updates are correctly implemented afterwards. One of the biggest SEO problems ecommerce sites have, is cannibalisation. 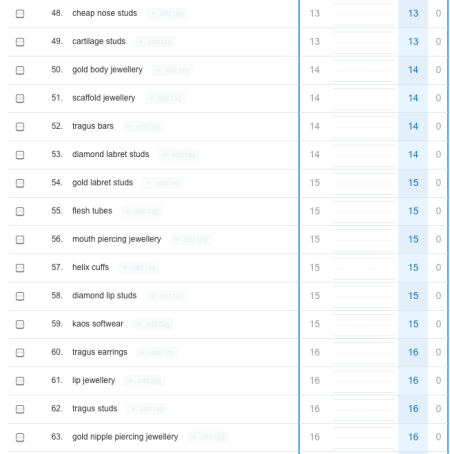 This is where multiple pages compete to rank for the same term and Google drags them all down because it appears that there is a lack of onsite SEO management. 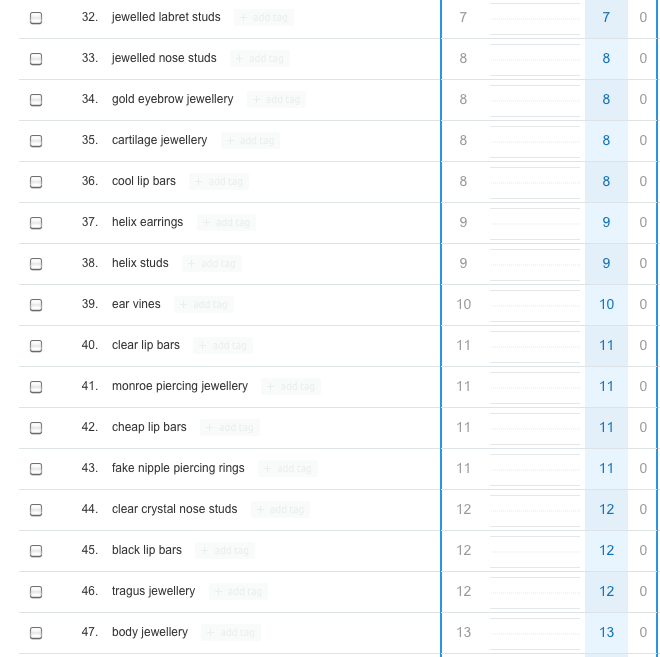 We worked very hard to make sure the categories and sub-categories would not behave in this way. To avoid this, we had to consider the metadata carefully and differentiate the use of keywords. In many cases we had to use canonical tags to allow a url to ‘give way’ to another url that we want to rank for X keyword. K7 is set up in such a way that the same content can be found in multiple areas of the site – something the owners have done for usability. Without careful attention to the use of canonical tags, this can really bring down the level of SEO success you get. 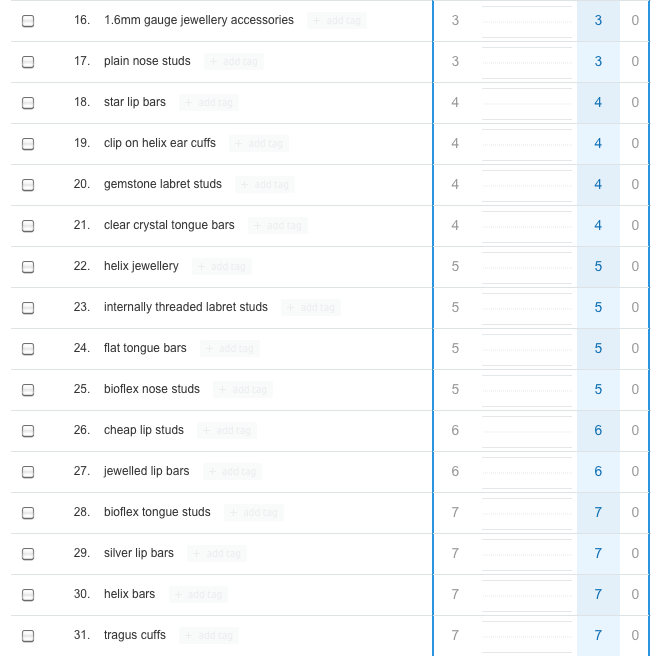 One clear way to monitor progress after an audit like this, is to track your newly established keyword list before you implement any of the onsite changes. This way you can simply see if things are moving in the right direction. Below is a snapshot of some of the rankings before the new metadata is implemented. Once all the initial audit work has been implemented, the rankings will be shown below for a comparison. To accompany the metadata overhaul we studied the blog and discovered that despite some high-quality content being produced, it was getting less than 100 views a month. Something was wrong. We consulted on various robots.txt additions to restrict what Google was indexing. The reason for this was that Google was seeing a mass of duplicate content because of the use of tags, categories and archives – something we see a lot of with wordpress based blogs. We also audited the content to ensure any duplicate text was deleted or 301 redirected to the original post. Finally we audited content quality and made sure thin content or overly promotional content was deleted with the old url being 301 redirected to the root blog page. As we worked so well together, I proposed the idea of working in the future on a different basis. I wanted to work for X amount of days per month, in exchange for X amounts of the gross profits. Based on both Convert Digital’s reputation and the directors reputation, this was open for discussion. This type of deal can work well for businesses that have a lot of room for improvement and need SEO to help them achieve the success that the market dictates. As this company is less than 2 years old and has not got a strong hold on the organic visibility, it is quite a logical decision. Convert digital now have to grow the organic traffic and make the project reach a profitable point. Of course, at the beginning this type of deal is not going to be generating you the same amount that a retainer for the same amount of days per month would be. It is the room for growth that makes this a mutually beneficial agreement. To understand what % of gross profits and exit you believe you should be receiving, you have to understand the size of market and the current gross profits for the company. You need to take in to account advertising spend and how it may fluctuate, but realise that advertising costs could yield greater sales, and therefor potentially a higher return for yourself. You need to see what X amount of days per month currently will equate to based on your desired %. If you can afford to work at this much lower rate until the gross profits increase, then it could be very rewarding in the longterm. Obviously the most rewarding stage of this type of deal is when the company is sold. If the owner of the company has a good track-record of selling businesses and does plan to sell the business, then the end reward could be well worth the risk. You also have to consider how often you will receive payment, as the accountant of the company will have to calculate your earnings. Receiving payment every quarter may be more feasible for many companies. We are now implementing the onsite changes from the initial audit and will continue to develop the onsite SEO. There are numerous digital marketing projects to carry out from here.